When you engage the services of SeaNav Electronics, you are guaranteed professional installation and quality affordable systems that give your large, small, new, or used boat the appearance of factory installed equipment. Our experience includes custom installations which can include engineered wood grained panels, total reconstruction of the helm area to elegantly maximize space, and surround sound systems with unique removable wall mounted LCD televisions. For over fourteen years, we have turned dreams into reality. Please take a tour of some of our work. We bring over 22 years experience in the electronics field, both locally on Cape Cod and in a New England-based Fortune 500 military contract company. Our formula for success is quite simple - Form, Fit, & Function. Without these you cannot deliver a quality product. Simply beating the clock and taking shortcuts in quality is never an option at SeaNav Electronics. 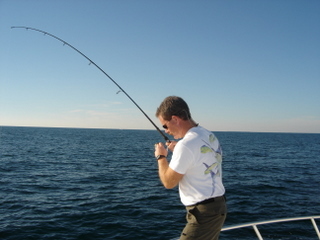 Our company services the commercial and recreational marine industry in the overall New England region. We are also available to travel to southern US locations as needed. Our mobile vans are fully equiped with everything that is needed to complete your project. We service all the products that we sell. Technicians stay current on the latest products and methods by attending yearly manufacturers' training sessions. 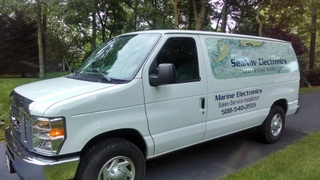 We are certified with nearly all marine electronic manufacturers to sell, service, and install their products. We have access to most major brands of marine electronics. Technician Valarie Julian gets put to the test and squeezes into tight spots when needed.